Allow yourself to benefit from the incredible healing powers of our luxury healing gemstone jewelry. 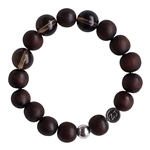 At zen jewelz, we have thoughtfully created one-of-a-kind magnificent energy stone bracelets and necklaces specifically designed to address the spiritual and physical needs of men. Relieve stress, channel your inner victor, project fearlessness and attract positivity with our fashionable and luxurious gemstone bracelets and necklaces. Custom pieces are available.